The Hyper Lite by XLR is as rugged as you are, inside and out. 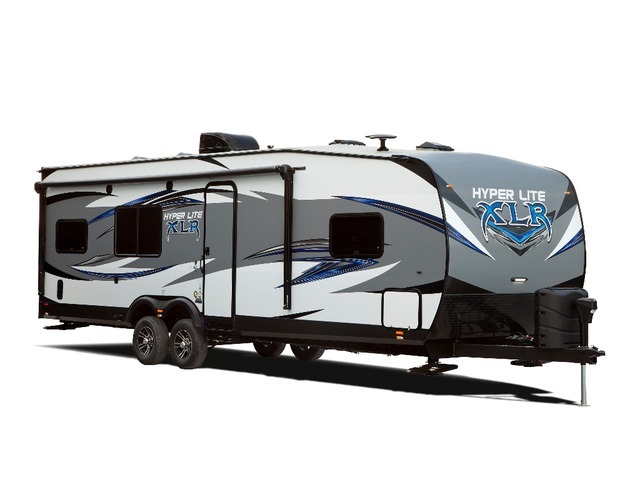 Hyper Lites are constructed with lightweight, vacuum-bonded aluminum sidewalls and gel coated fiberglass making them easier to tow. Dry Weight 5,272 lbs Pin Weight 1,226 lbs Overall Length 25' 0"
Dry Weight 7,813 lbs Hitch Weight 1,135 lbs Overall Length 33' 3"
Dry Weight 6,817 lbs Hitch Weight 915 lbs Overall Length 32' 11"
Dry Weight 8,743 lbs Hitch Weight 1,500 lbs Overall Length 37' 10"
Dry Weight 7,282 lbs Hitch Weight 1,124 lbs Overall Length 35' 1"
Dry Weight 8,483 lbs Hitch Weight 1,035 lbs Overall Length 35' 9"
Dry Weight 7,669 lbs Hitch Weight 1,314 lbs Overall Length 36' 1"
Dry Weight 8,988 lbs Hitch Weight 1,265 lbs Overall Length 38' 0"
Dry Weight 9,608 lbs Overall Length 37' 10"